Diggers Valley: 22 December 2018. The week beginning the 22nd of December 2018. The twelve-pair mob in the Windmill paddock late this morning. 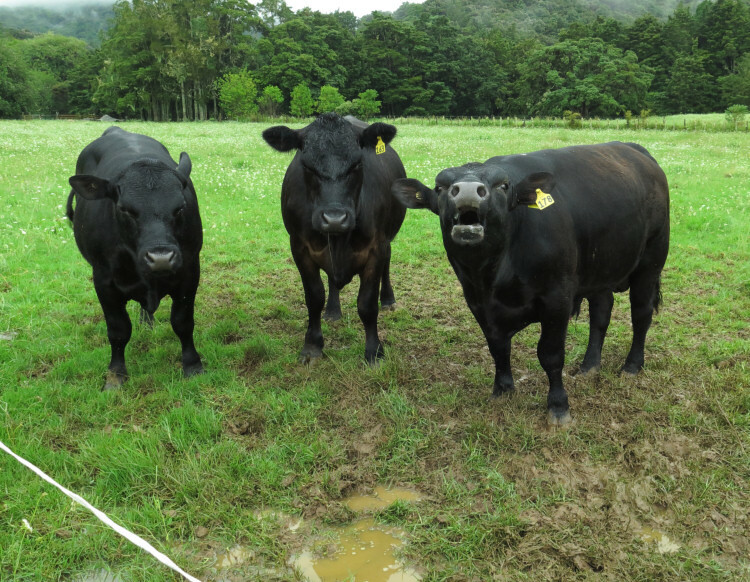 792 is the skinny cow on the left, now three years old and with her second calf at foot. Like her mother, Endberly, she will mature into a more solid cow in time. 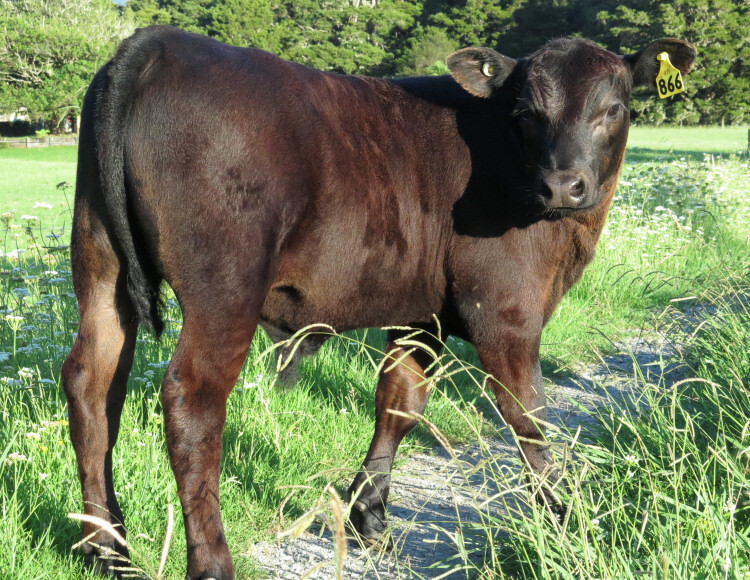 Heifers have to work quite hard to produce and rear their first and second calves while still growing, themselves. Rain fell throughout the afternoon, bringing our total for December so far to 160mm. 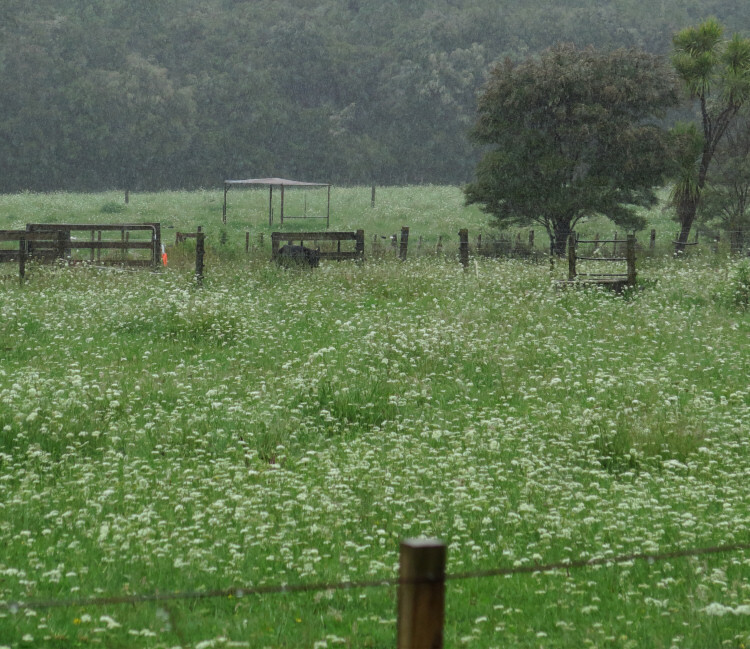 Rainy Decembers are a real boon for grass growth and easy farming. 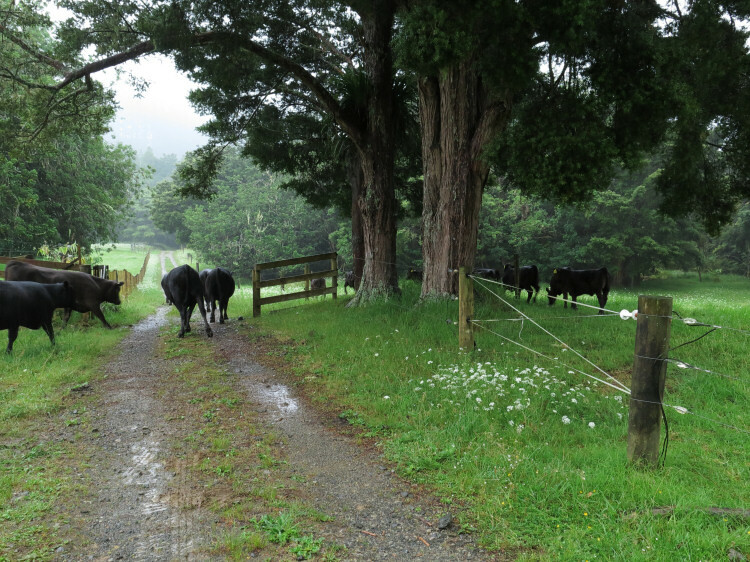 When the rain stopped, I went out to move cattle. 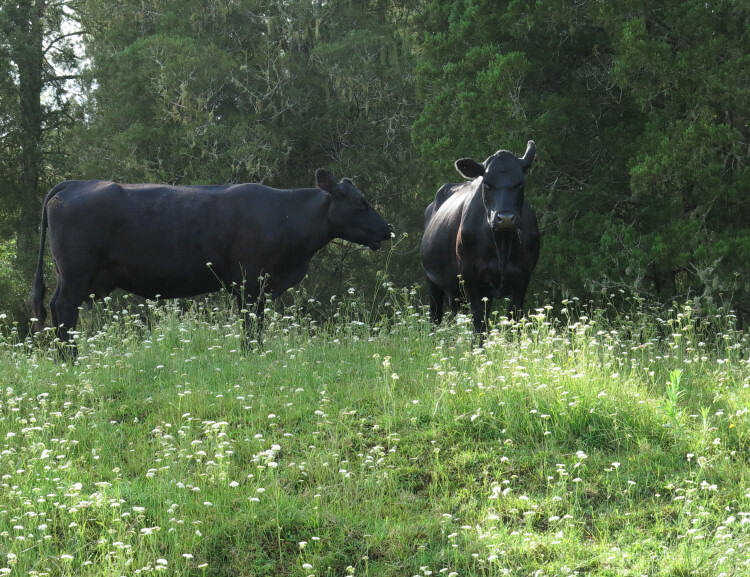 As the young mob of 14 animals walked up the lane towards the Pines paddock, they were excitedly accompanied by nearly all the calves in the Windmill paddock. 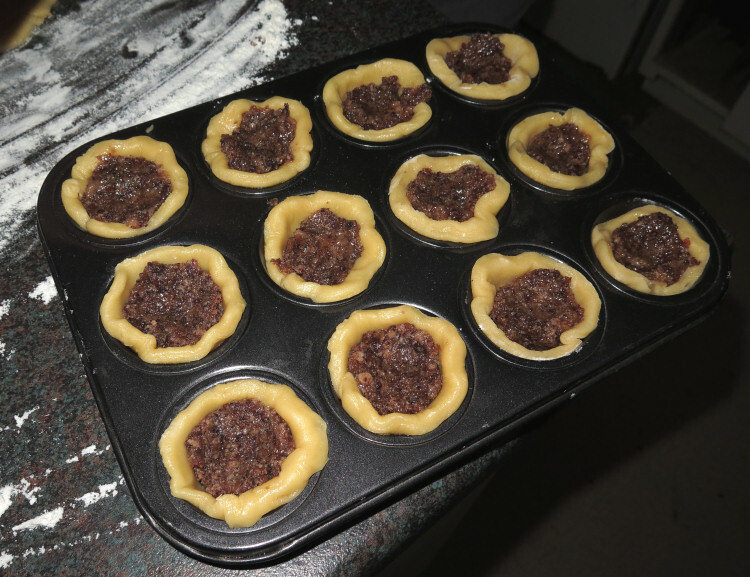 It rained most of today, so Stephan started doing some Christmas cooking: first Christmas mince pies, with the fruit mince he made two years ago, now matured to utter deliciousness. Then he cooked a small ham he'd found in the freezer and glazed it not long before Sandi and family from next door came over for a visit and swim, just in time to share some of it with us - an impromptu lunch-time feast. 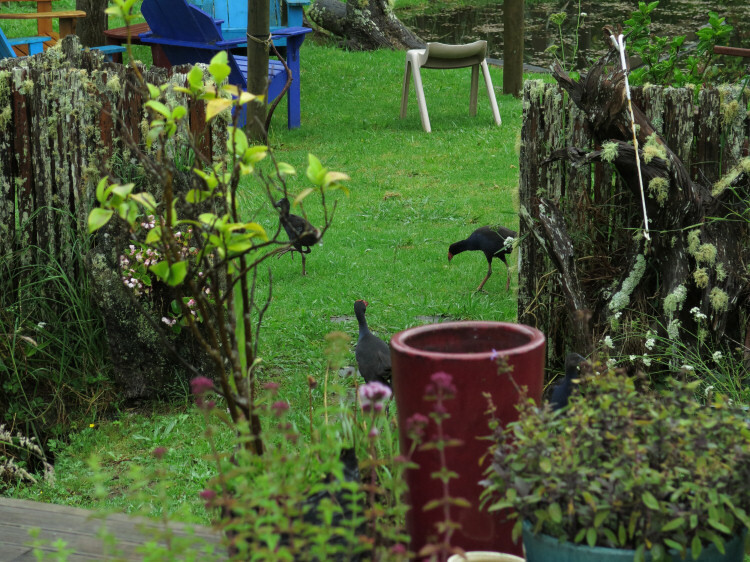 Later when the rain stopped, the Pukeko family made full use of the garden again. Two bulls and the steer, making a muddy mess in the corner of 5d, diagonally opposite 5b where I stood and where Jet 777 and white-faced 749 were on heat together. 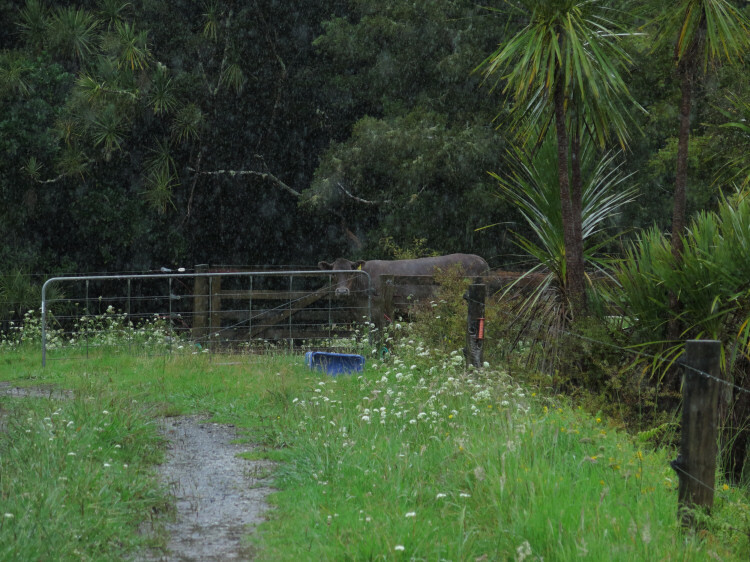 I decided the bulls were a bit too interested so moved the cows into Flat 3 - partly also because the weather forecast had predicted the possibility of thunder storms and I wanted them to have more shelter in a larger paddock than this one provides, in case of loud, frightening noises. 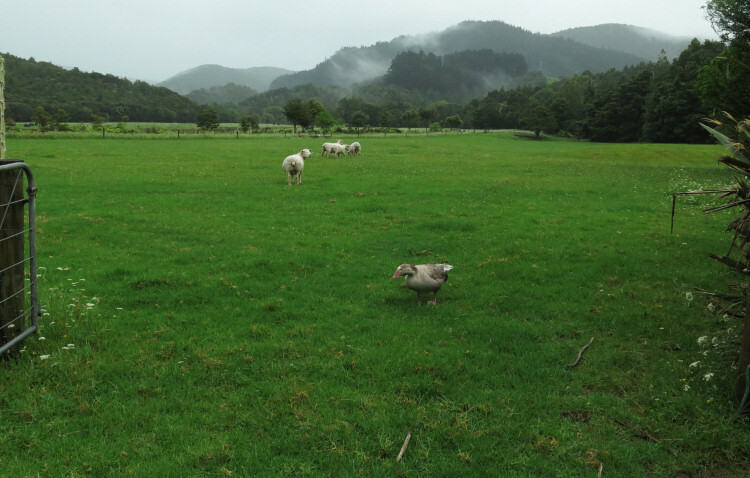 The other problem with thunderstorms is the risk of severe downpours leading to flash flooding and us needing to get up in the middle of the night and move the sheep... or we could just do it now to save the worry. 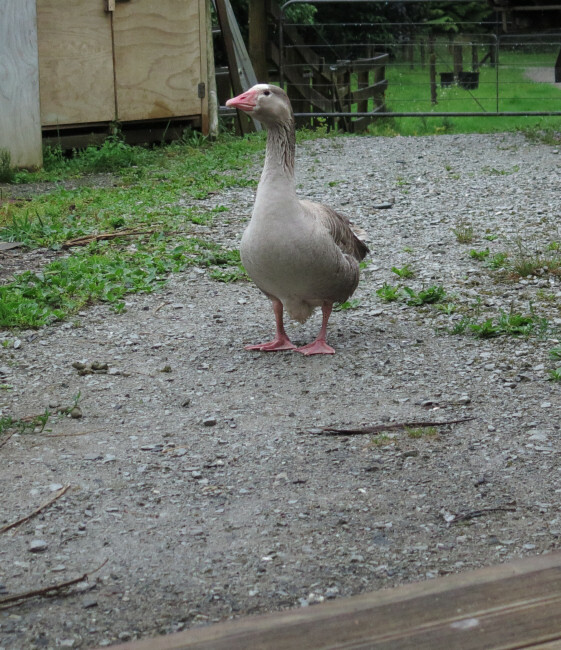 I don't know that I'd be risking shitting on the deck on Christmas Eve if I were a goose. We don't know why she's given up being a sheep. I wish they'd all sort out whatever they disagreed over, so she can go back and be friends instead of honking around in the driveway and leaving great stinking piles of poo everywhere. 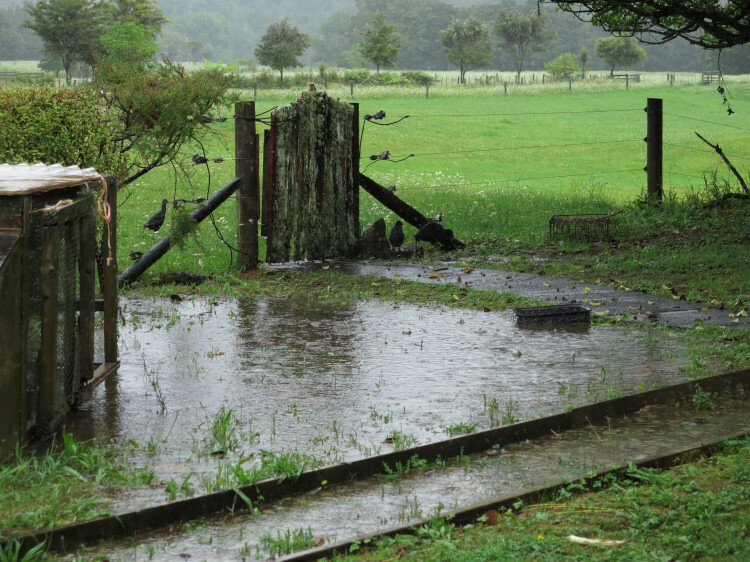 Heavy rain was forecast for the afternoon but it didn't look like it was coming until it really did! 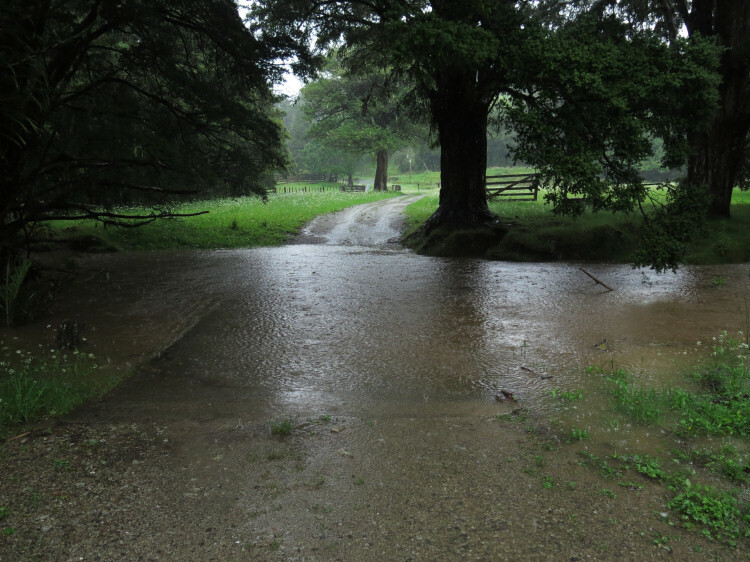 A lot of rain fell in an hour and I kept going down to the stream near the pond, expecting it to come up and over the corner. When it didn't I hoped the resulting flooding wouldn't last so long that we'd not get out in time for dinner! Of course the water came up over the bridge but for a while I thought this might be the extent of it. 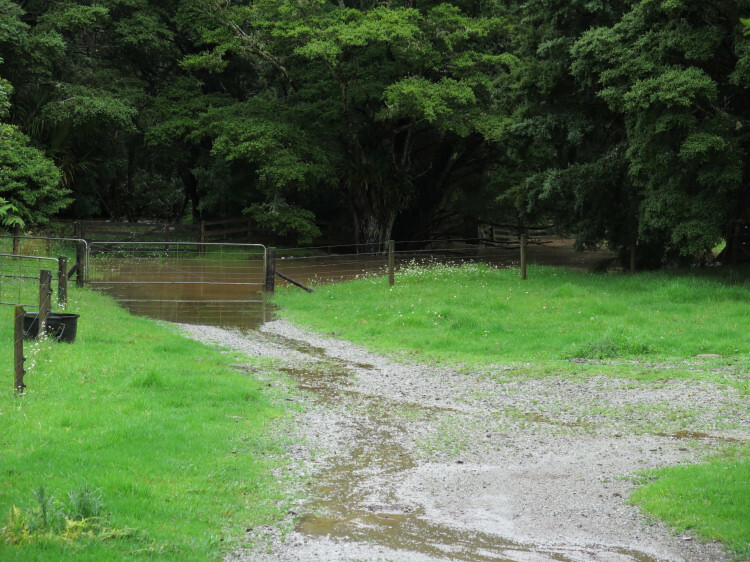 In this picture the water of the Waikawa Stream is unusually calm because the Taheke Stream coming down from the back of the farm (they meet a few metres down to the left) was higher than the Waikawa coming down the valley from the right. The water wasn't quite flowing upstream but the Taheke was certainly blocking the Waikawa's usually fast flow during flooding. After milking this morning, 807's calf had gone under the spring gate and away up the lane, instead of into the paddock. He did the same thing yesterday, so I left him to it, figuring he'd eventually learn something from his poor choices. Just after four I heard him and his mother calling to each other, so I called to him to come down to the gate he'd refused earlier in the day. To my surprise he walked calmly back down along the lanes toward me. To my even greater surprise, his astonishingly clever mother didn't go up to the top of the paddock to where she'd be closest to him but walked away from him and back to the gate into the paddock, where she waited as he came along the lanes. This intelligent and charming animal really could do with a better name than Grey 807. Any ideas? The flooding didn't subside as quickly as I'd hoped, dashing our plans to go out to Elizabeth's for a fine ham dinner. Elizabeth's glazed ham is not to be missed, but on this occasion we sadly could not help it. We could have dashed out earlier, before the streams came up but then we'd have been stuck out, uncertain about what might be happening at home. 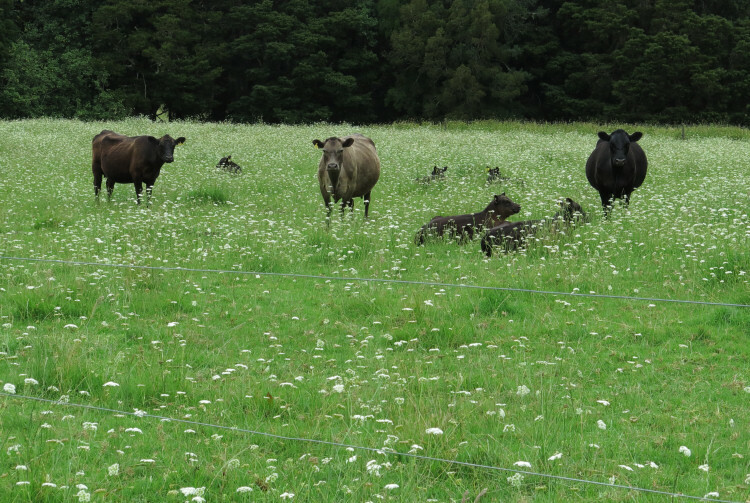 I moved both mobs of cows and calves this morning, into neighbouring paddocks so they can have some familiarisation time. In a few days I'll draft them for mating, necessitating some mingling and re-sorting of the social order. 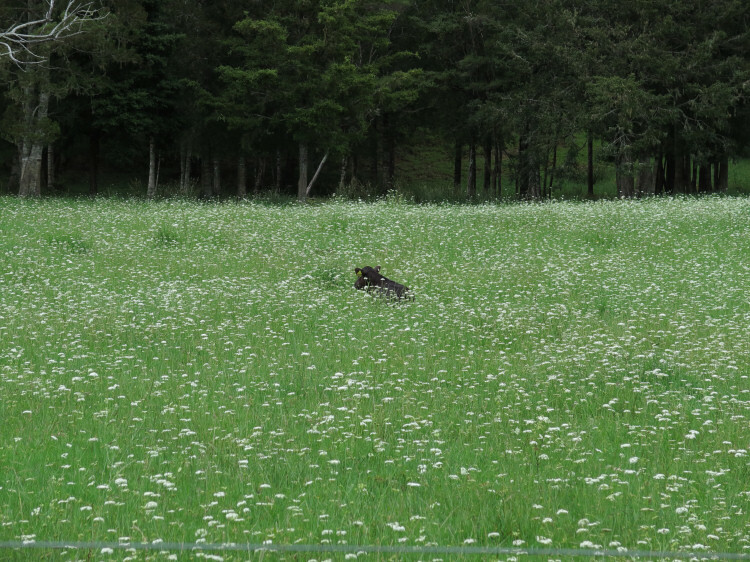 I took a picture of this calf, all alone and sitting, when everyone else was still actively exploring the new paddock or over by the fence near the other mob. She's 869, 729's daughter and I wondered if something was wrong with her, although with her ears up, she appears well enough. We spent the rest of the day at Elizabeth's house with lots of the family. After ham on Christmas Eve, Elizabeth always cooks an enormous turkey with all the trimmings, on Christmas Day. 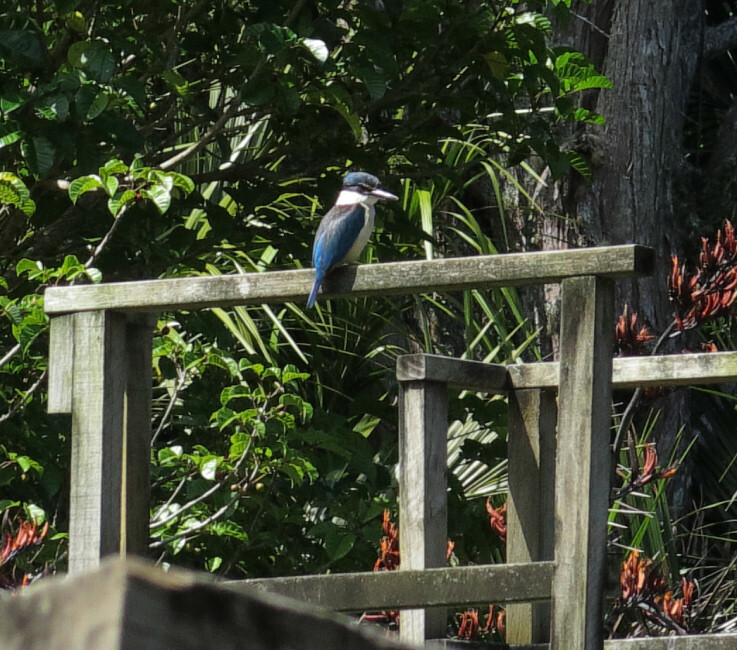 A Kotare sitting atop the slide by the pond. 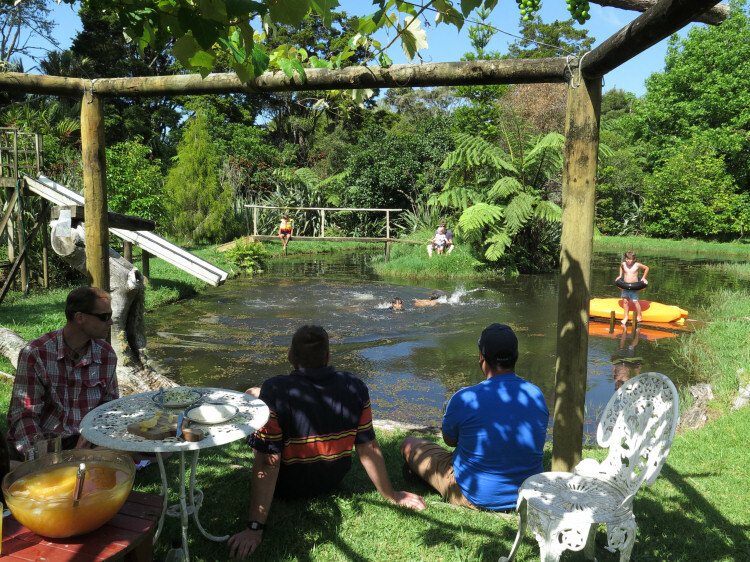 At around three o'clock, lots of people arrived for the Boxing Day gathering. Neighbours Annina and Pascal came down too, and Simon, Anna, Evelyn and new baby Alfred arrived soon after, having come up from Auckland earlier in the day. The shade under the expanding grape vine was lovely. The vines don't quite cover the whole area yet, but in the afternoon were in all the right places for the sun's position. 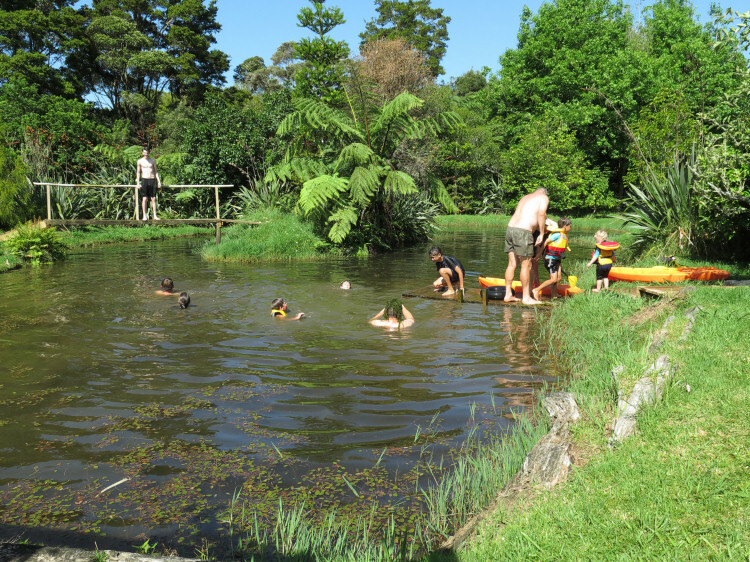 There was, as usual, much swimming! 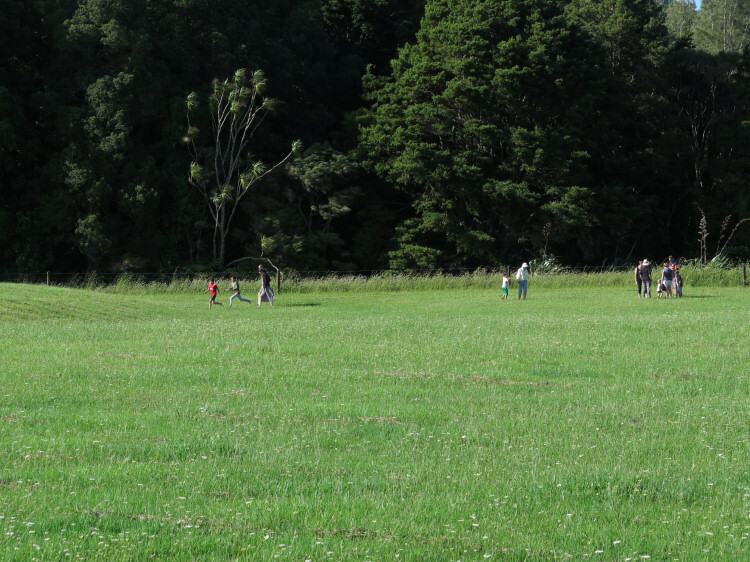 While food was being readied, lots of people went off for a walk amongst the big trees adjacent to the House paddock. I went out on the bike to check on the cattle, who were making a lot of unexpected noise, which turned out to be complaints about there not being as much feed as they'd like. 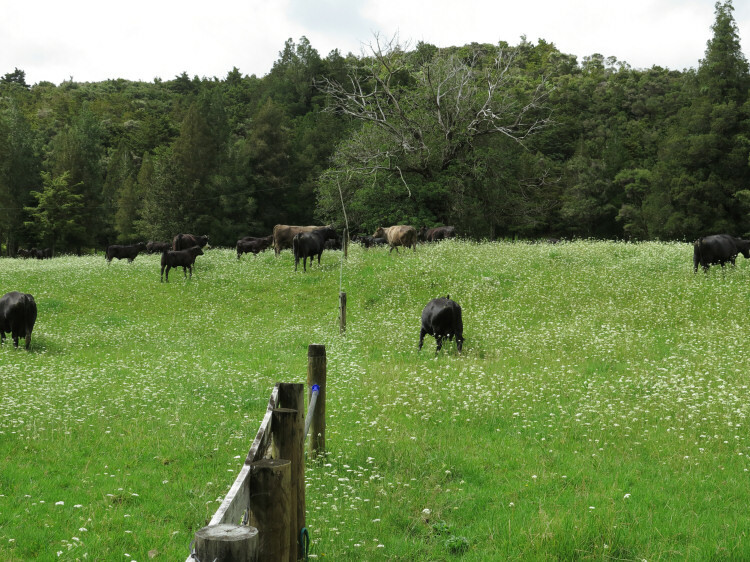 I moved one of the mobs, from Mushroom 3 to the Bush Flat across the stream and had to do a short dash to ensure a group of calves went with all the others, and nearly collapsed! I wasn't sure what was going on but my chest and breathing did not feel good. I slowly walked to shut the cattle in and rode back home. I asked Sarah and Elizabeth to keep an eye on me and sat quietly for the rest of the evening. A quiet day of weed control, Stephan hunting ragwort and I pulling Tarweed along the Bush Flat lane where I discovered rather a lot more I had missed on an earlier pass, growing in the long grasses in the now-fenced drain area. Emergency (left) and Eva, standing together as I prepared to open the gate to move their mob this morning. 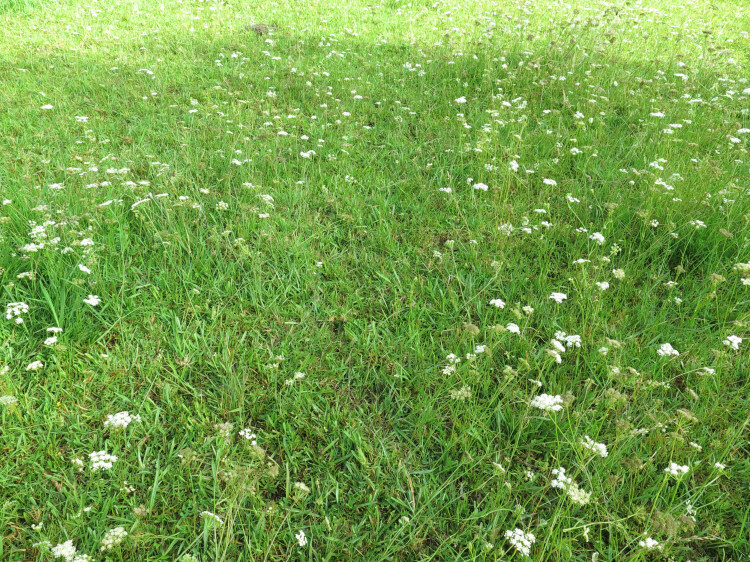 The cattle are adept at eating the grass growing between the Parsley Dropwort flower stems but it's not as easy as it will be once we've mown the paddock to improve things for their next time here. 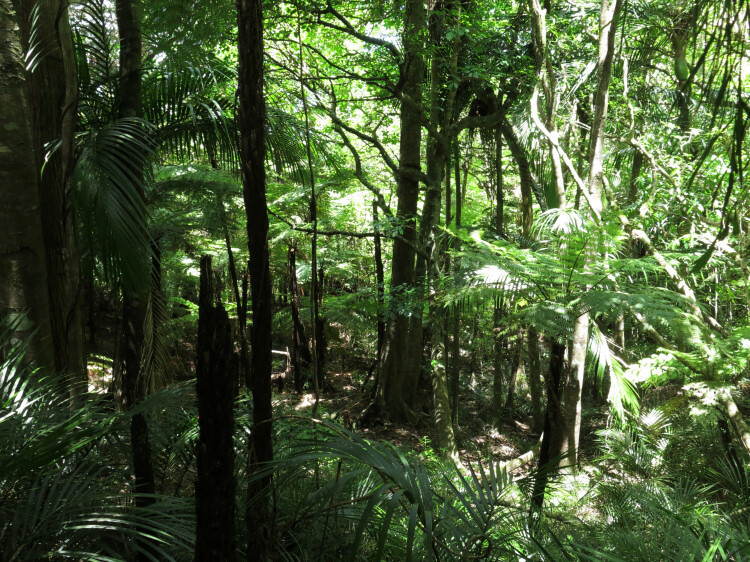 This afternoon we arranged a bush walk with Annina and Pascal, to go and explore the hillside they see from their house, part of the Buselich Reserve. 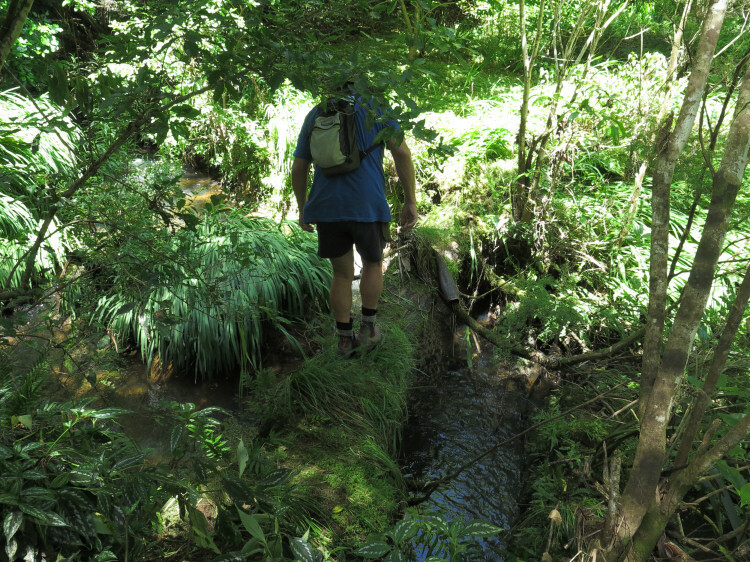 Stephan used to service a trap line through the reserve, so he knew where to lead us across the stream. I thought this a very convenient fallen tree trunk but Stephan says it's one of the old stringers from Marco Buselich's bridge, used probably back when he had a mill set up on the road side of the stream. It is such a pretty place. Pascal and Annina had not realised this was public Conservation land, where they could have walked any time. 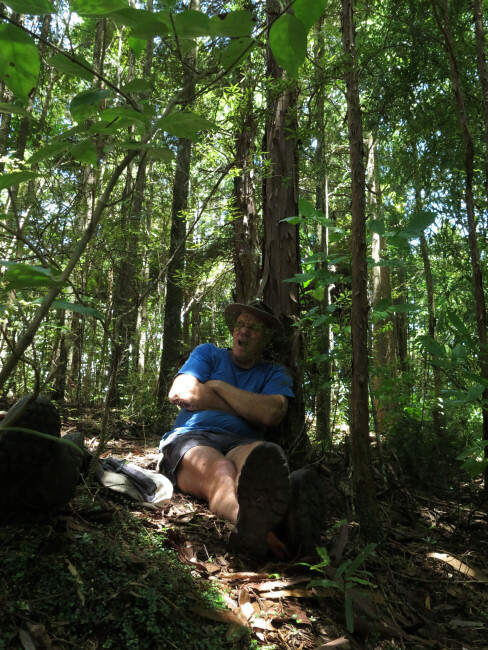 We tired ourselves out on such a hot day, so sat down for a rest at the top, under the fabulous Kawaka trees. After a while we set off again, everyone foolishly following the person who, despite holding the GPS device, still had no sense of which direction we were walking, until Stephan pointed out that if we kept walking in the direction I'd led us, we'd come out in one of our paddocks, not back over where we'd started and meant to walk back to. I had marked a number of GPS points of interest from the satellite picture but in the bush, couldn't quite work out which marks were which. I needed to have done a little more note-making for clarity. 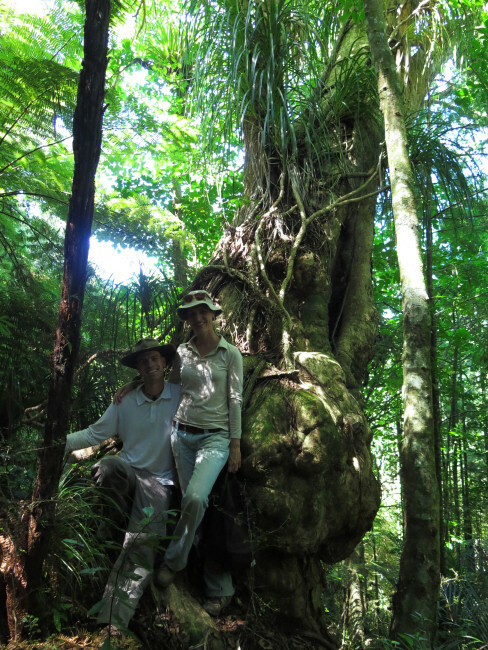 One of the places we had to go back to was this huge Puriri, the one Annina and Pascal look out at every day. Our wander in the bush took just under four hours and we were pleased to collapse for a while with cold drinks on A&P's comfortable couch, looking over at the lovely bush, before heading home again. 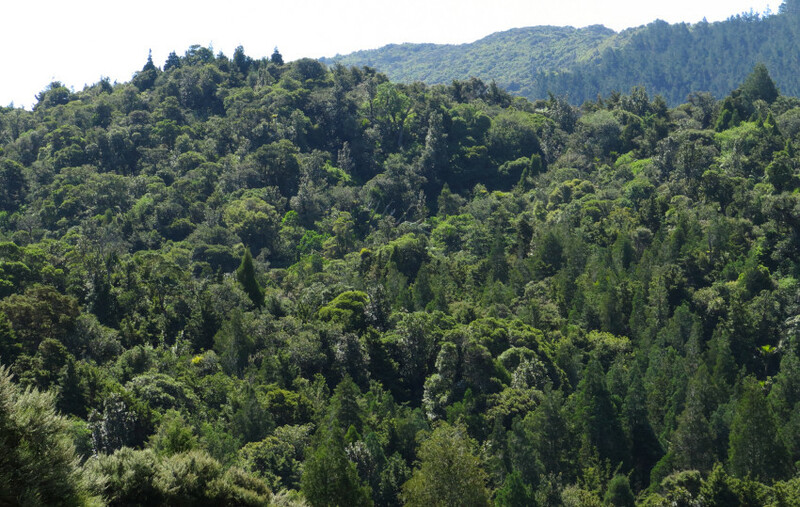 The high point on the left is where the Kawaka trees grow. Our Bush Hill block is out of the picture to the right and the pines in the distance are of the block of trees growing along our back boundary. Grey 807 is doing a fine job with this, her first calf.